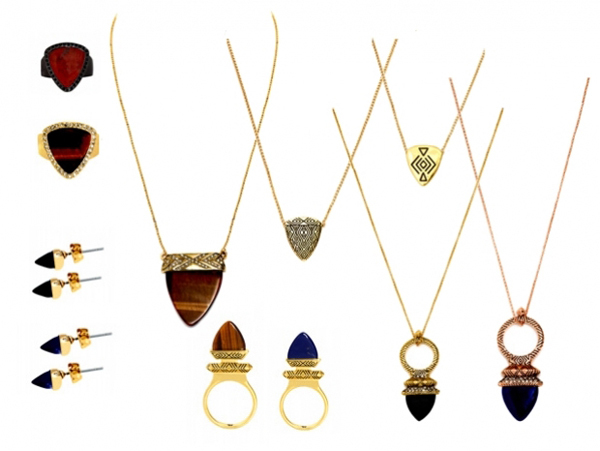 The previous jewelry collections created by the famous it-girl Nicole Richie for House of Harlow 1960 were quite successful, so for the coming season she designed a Fall 2013 jewelry collection that will definitely draw attention of the fashion-forward girls and Nicole Richie’s fans. The jewelry pieces in the new line range from modest to the statement ones, which allows you to choose pieces that suit your personal taste and add a touch of sophistication to your fall looks. While in the styles of the previous seasons an accent was made on the edgy and fierce lines, this time the jewelry pieces ooze a more feminine and delicate vibe. This latest House of Harlow 1960 Fall 2013 jewelry line reflects Richie’s musical background and clearly demonstrates a tendency towards the triangular shapes and original patters. Even though this collection represents celebrity’s personal style, the pieces from this range definitely keep up with the latest trends in the jewelry industry demonstrated by the major players in this field. This House of Harlow 1960 collection by Nicole Richie features minimalistic earrings, chic necklaces, chunky rings and statement bracelets. Each item is distinguished by a certain detail that makes it stand out from the rest of the pieces. So it is hard to pick my particular favorite from this collection, but one thing is certain – the accessories from this range perfectly match the tone of the Fall time and will deliver a proper amount of drama and elegance to your looks. Those of you who are not afraid of being bold and look for ways to introduce some colors into your fall looks can find the striking alternatives in red, cobalt blue and light brown to complement your outfits. The great range of alternatives allows finding beautiful accessories to meet your personal preferences and mood for a particular day. Thanks for your marvelous posting! I really enjoyed reading it, you may be a great author. I will make sure to bookmark your blog and may come back in the foreseeable future. I want to encourage continue your great job, have a nice weekend!